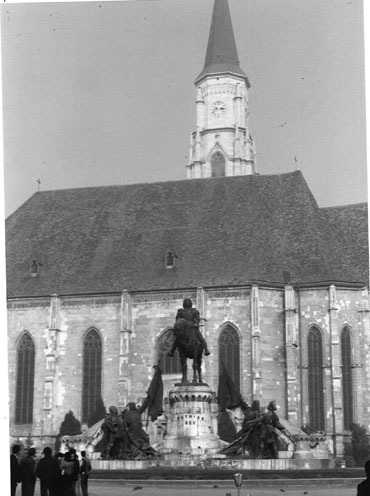 St. Michael's Church and statue of Mátyás Corvinus, Cluj-Napoca. No written or architectural evidence bears witness to the presence of "proto-Romanians" the lands north of the Danube during the millennium after Rome's withdrawal from Dacia. 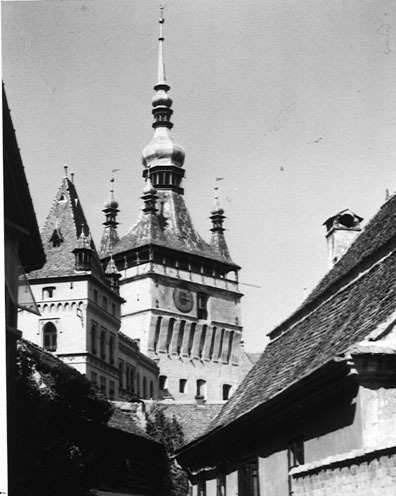 This fact has fueled a centuries-long feud between Romanian and Hungarian historians over Transylvania. The Romanians assert that they are the descendants of Latin-speaking Dacian peasants who remained in Transylvania after the Roman exodus, and of Slavs who lived in Transylvania's secluded valleys, forests, and mountains, and survived there during the tumult of the Dark Ages. Romanian historians explain the absence of hard evidence for their claims by pointing out that the region lacked organized administration until the twelfth century and by positing that the Mongols destroyed any existing records when they plundered the area in 1241. Hungarians assert, among other things, that the Roman population quit Dacia completely in 271, that the Romans could not have made a lasting impression on Transylvania's aboriginal population in only two centuries, and that Transylvania's Romanians descended from Balkan nomads who crossed northward over the Danube in the thirteenth century and flowed into Transylvania in any significant numbers only after Hungary opened its borders to foreigners.